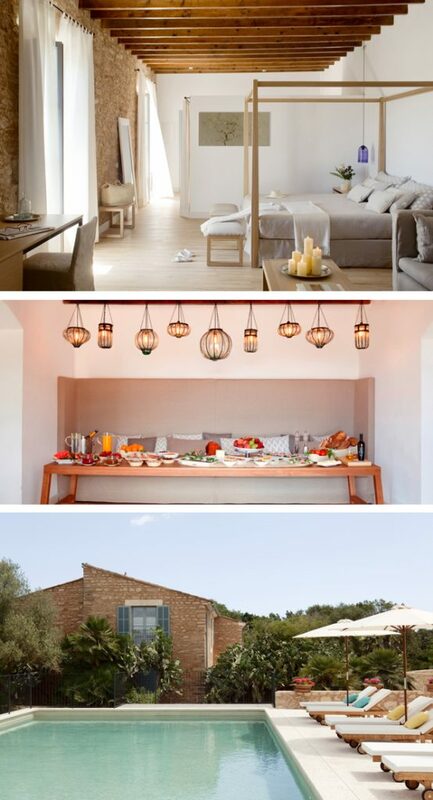 We’ve delved past the party resorts of these islands and found some seriously special spots on Mallorca, Menorca and Ibiza where you’ll feel utterly spoilt. A feeling of understated luxury permeates this rural retreat alongside its signature scent: a calming mix of lavender and rosemary that gives you a feeling of utter relaxation. The light-filled rooms have huge beds (perfect if you’re struggling to get comfy) and very special bathrooms. If you want to hide away just the two of you, we loved the Garden Cottage which has a lounge and a bedroom joined by a pretty private terrace. We were blown away by the food in the restaurant and loved eating breakfast on our terrace before spending lazy days by the saltwater pool. Spoil yourself: the indulgent sea-view spa offers a range of relaxing treatments from facials to manicures. A little extra: a welcome drink on arrival for booking through i-escape. Top tip: If you want a change of scene, head to the tiny but very beautiful sandy cove of Cala de Binidali. We fell into an easy rhythm during our stay at this dreamily romantic hotel: days of reading, lazing, siestas and delicious meals were only punctuated by little trips out to the beach and nearby Capdepera with its 14th-century walled castle and Wednesday market. The food was out of this world. Gastronomic with an emphasis on local produce and exquisite presentation, you can expect dishes like seabream stew with a potato and hazelnut fondant or hake with raisins, pine nuts and a pumpkin foam. Rooms are beautiful and beds enormous – expect to sleep like a log. Spoil yourself: Just relax. Bag a double day bed by the heated pool or flick through the coffee table books in the communal guest lounge. Top tip: Visit Cuevas de Arta – vast caves outside the medieval city of Capdepdera which contain gigantic stalactites – the biggest dangling down 26m at the time of writing, and still growing. 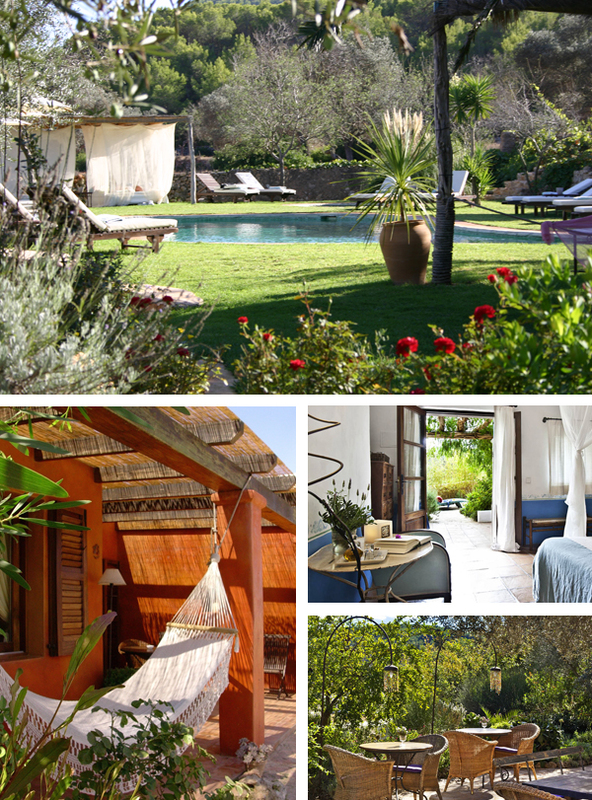 This laidback finca sits in a tranquil, remote valley; you’ll need an up-to-date sat nav. Hosts Maria and Barbara are so welcoming, and dedicate time to speak with each guest to help them get the most out of their stay. They’ve created a cosy and colourful retreat where all of the beautifully decorated bedrooms have private outdoor space, and indulgently deep claw-footed tubs in their bathrooms – just the ticket for soothing away backaches and tiredness. Breakfast, lunch and dinner are all served in the alfresco restaurant, there’s a gorgeous pool and a tiny spa – you never have to leave and we doubt you’ll want to. Spoil yourself: Make the most of eating for 2 and tuck into the indulgent afternoon tea – the ‘Forte’ brew is served in old-fashioned steel teapots alongside freshly made cakes and pastries. Top tip: If you can drag yourselves away, hire a car and explore: we loved lingering over lunch at S’Escalinata in Eivissa’s Old Town and browsing eclectic homewares at Sluiz Ibiza near Santa Gertrudis.